Last time we started looking at some of the types of Vardos that are being used as living quarters. 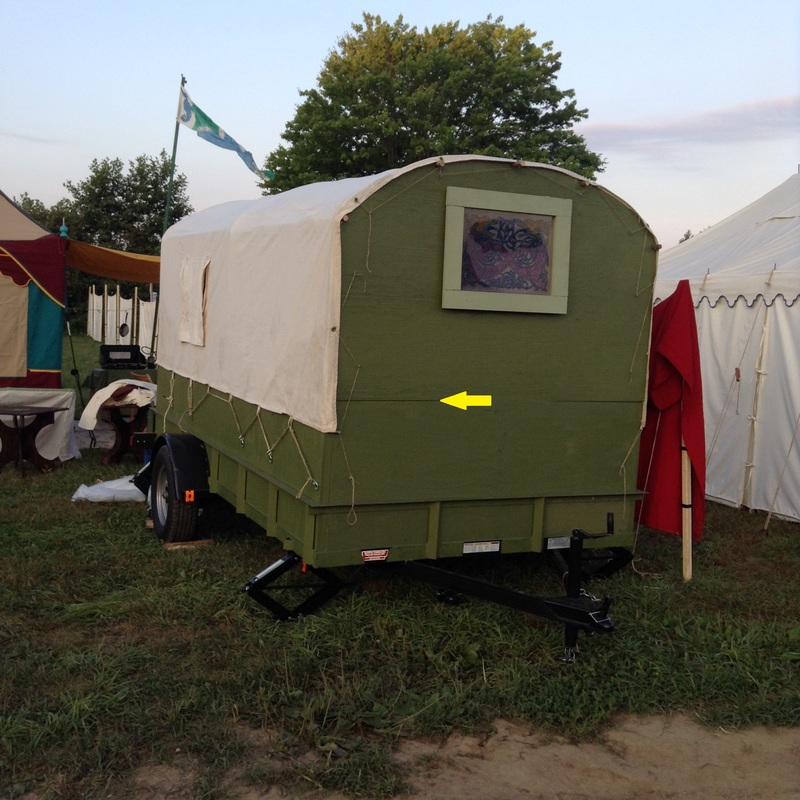 And I mentioned that this Vardo was the first one that I ever saw at an SCA event. When I first posted this picture I was immediately contacted by folks who knew the owner of this marvelous gypsy wagon. And fortunately for all of us that are really interested in such things, she has websites! The wagon in the picture is actually her second gypsy wagon. But to understand it, you really need to watch the building of her first one. 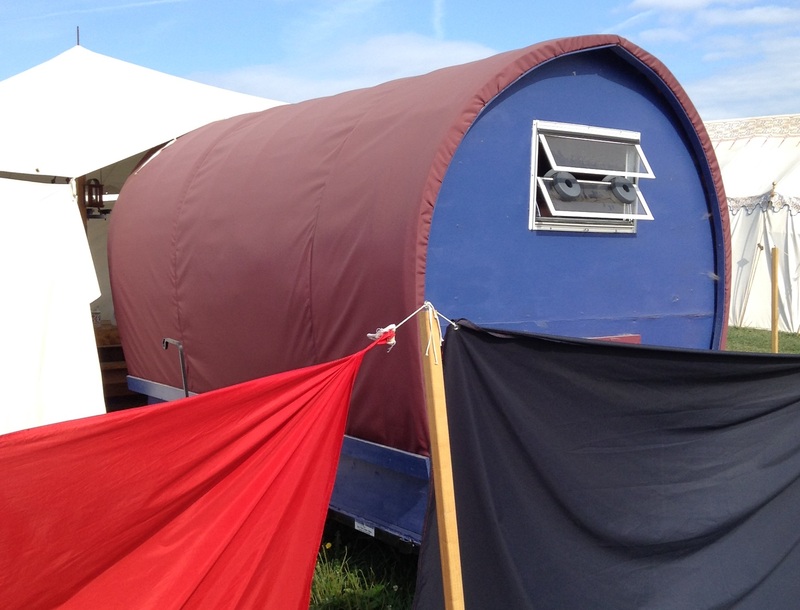 So here is her original gypsy wagon website. I was trying to think if I remembered the original wagon. My husband says yes, and the dates are certainly appropriate for me to have seen it. And here is her second website, which follows the construction of the second wagon at the location of a professional “caravan” maker in Canada. I was familiar with the term from watching British television. They call all sorts of small RVs “caravans”. I should warn you about the caravan maker’s site. I found myself just wandering around in it and dreaming of owning my own caravan and designing in all sorts of cool things. Having spent quite a bit of time in and around RV’s I have a certain affection for the beasts. There are obviously many different ways of making Vardos. The professional caravan site gives several ideas and shows a bunch of the types that she has made. But the canvas covered ones that I see most commonly in Arizona are made with a very different system. They use a light weight bow top, like the Conestoga wagons, to create a Vardo with a low center of gravity and an overall lighter design. This allows the Vardo to be pulled by smaller vehicles. This Vardo belongs to some Midrealm friends. If you are interested in how they built this Vardo, they have a Pinterest Page that documents the process. Plans for this general type of Vardo are available through the American Vardo Site. A friend who made one of these assures me that the book that they sell is very good. They also have plans, and for impatient people, an e-book. I love this picture of the three Vardos that magically appeared down the street from us this year. I love the differences in design and decoration. The use of bright colors on two of the wagons is very reminiscent of the painted designs that were used on traditional gypsy wagons in Europe. Even the location of the door on the Vardos varies. The traditional gypsy wagons from Europe, that I have seen pictures of, all have the door at the back. That way they do not have to be unhitched in order for people to go in and out easily. But the Vardo on the far right in this picture actually uses the tongue of the wagon to provide a location for a landing outside of the door. The addition of a sturdy set of wooden steps completes the entrance way. I have been playing actively in the SCA for over twenty years. When I started we were mostly day tripping to events, because we still had kids at home that required at least some supervision. Many of our friends also day tripped because of work schedules and other obligations, and the area of the kingdom that we lived in (East Kingdom) had huge numbers of events within easy driving distance of our home. 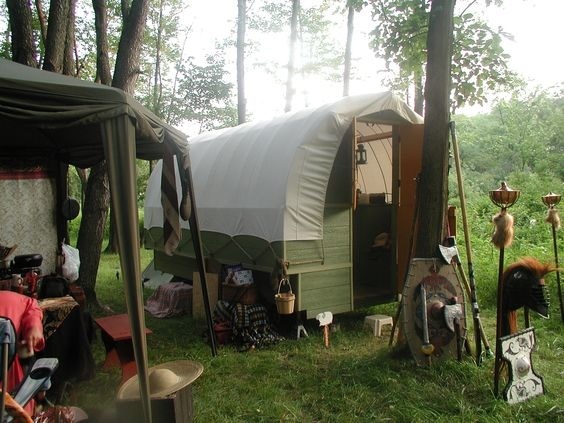 Our first real camping event was actually the Pennsic War in PA. We purchased a new cabin tent for the event, loved it, and put Pennsic as a permanent event on our schedule. But at this event we were exposed for the first time to Gypsy Wagons. There weren’t many of them, but they were really cool. This wagon has been in the same place on the same street for as long as I can remember. 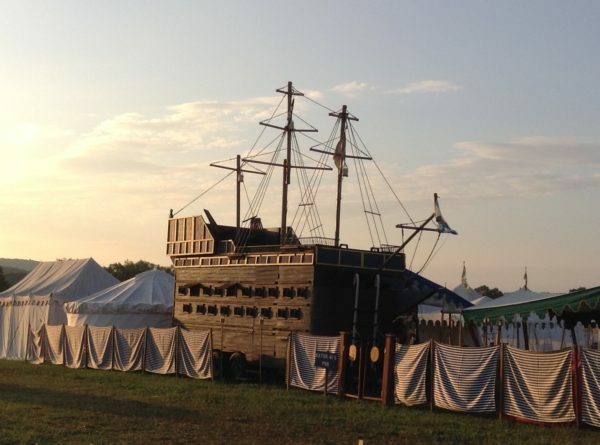 We also saw a giant Pirate Ship! Jump ahead a few years and we were in the West Kingdom. I never saw any gypsy wagons there (or Pirate ships), but RVs were becoming increasingly common and there were also some tent campers and camper vans. We had an RV ourselves. I have to admit it was pretty awesome. No folding up the clothing; the carefully ironed tunics and gowns were simply hung in the closet. And with the greater distances that we often drove to an event, we could roll in to a site at midnight and be in bed at 12:10 AM, with an inside flushie as a bonus. We were set up with a propane heater, a frig, a propane stove, and ceiling fans. If we had a hook-up, which we did at some campgrounds, we even had a microwave and an air conditioner. Luxury camping at its best. Jump forward another twelve years and we are in Atenveldt. And this is where we were exposed to the use of Vardos at weekend events. To be honest, we had never heard of the term. Technically speaking a Vardo is a traditional horse-drawn wagon that is used by the Romani people of Great Britain (gypsies). 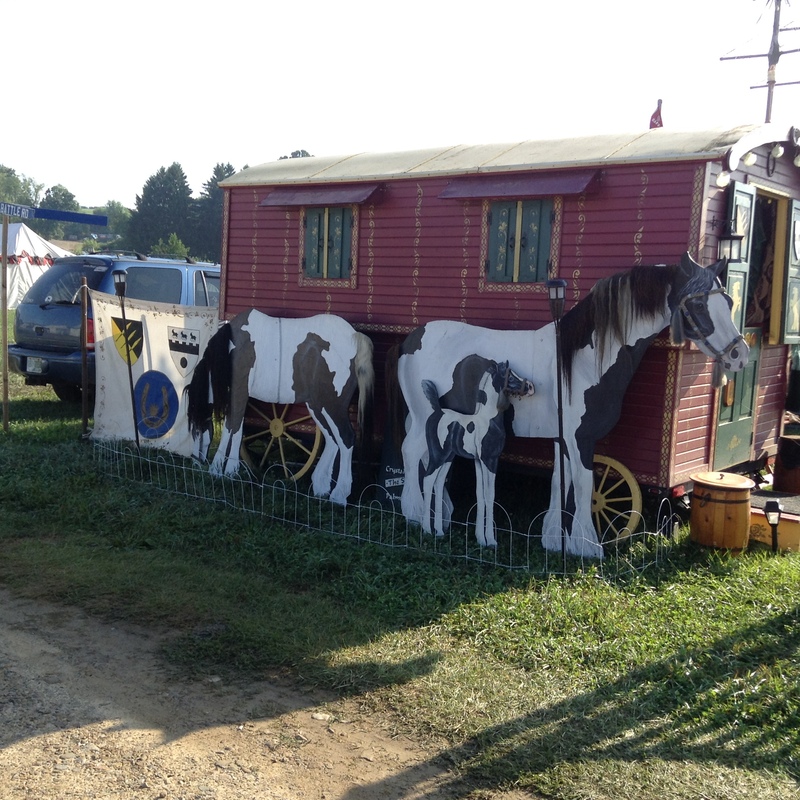 But except for the horses, and the lack of a wood stove, these camping wagons looked like Vardos. We actually knew two couples who had built their own canvas covered Vardos. 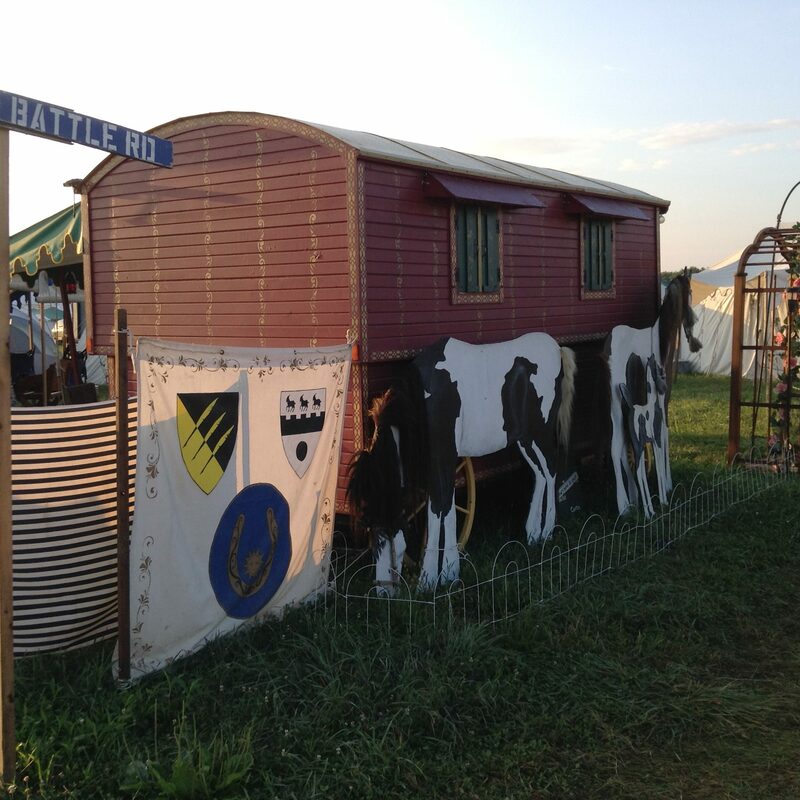 Like the RV that we used to have, they had the advantage of being a self-contained dwelling. You could just roll in to a site, chock it so that it didn’t roll away, and have a “home”. The chance of snakes, scorpions, or high water from a rain storm being an issue was minimal. You couldn’t easily level it the way you could our RV, but it was still an amazing camping solution. 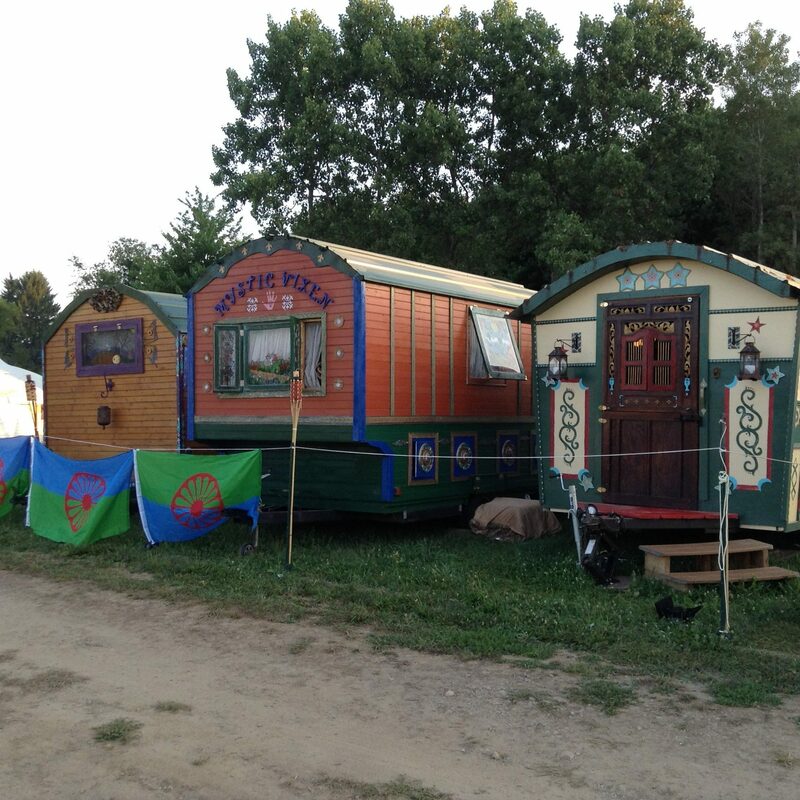 This year the proliferation of Vardos and other wagons at Pennsic was really noticeable. There have never been any on our block before, but this year there was one directly across the street from us, and several more down the block.